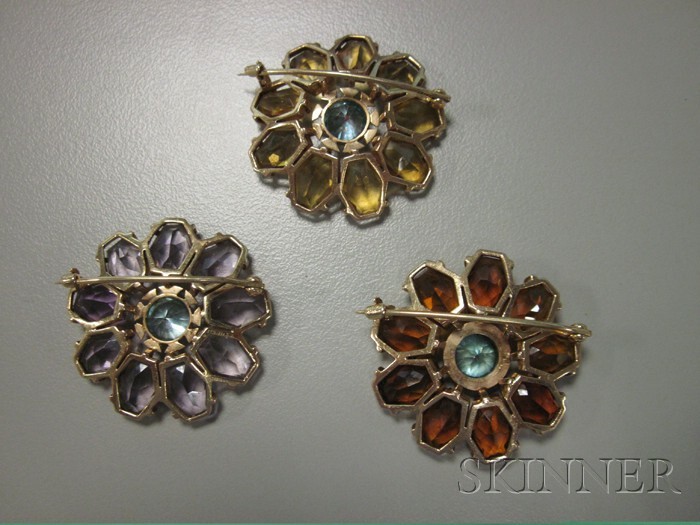 Set of Three Retro 14kt Gold Gem-set Flower Brooches, Binder Bros.
Set of Three Retro 14kt Gold Gem-set Flower Brooches, Binder Bros., with fancy-cut citrine and amethyst petals, blue zircon centers, dia. 1 1/8 in., maker's mark. Maker's mark on pinstem for Binder Bros. Typical facet wear to blue zircon seen with loupe.